Smoking is responsible for 90% of lung cancer cases and is a risk factor for coronary disease, Alzheimer’s, abdominal aortic aneurysm, cataracts, and GERD (gastroesophageal reflux disease). Not smoking is one of the American Heart Association’s “Simple Seven” healthy behaviors. Research has identified nine lifestyle habits—including not smoking—that collectively may be more effective than taking medications: for example, lifestyle can reduce cardiovascular disease risk by 90%, compared to a 20-30% reduced risk from pharmacological therapies. Smoking used to be the #1 cause of death in the U.S., but diet has bumped smoking to #2. Some unhealthy foods expose the body to the same dangers as smoking. 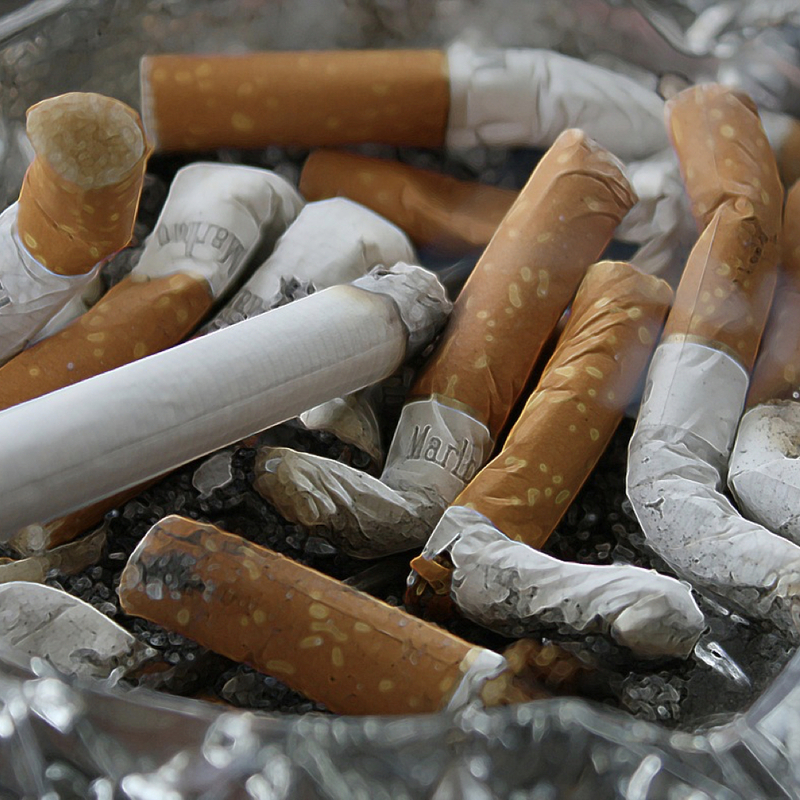 Cigarette smoke contains nitrosamines, a class of powerful carcinogens. One hot dog has as many nitrosamines and nitrosamides as five cigarettes, and these carcinogens are also found in fresh unprocessed meat. Consuming the amount of cholesterol found in a single egg per day appears to cut a woman’s life short as much as smoking five cigarettes a day for 15 years. Inhalation of cigarette smoke exposes humans to cadmium, a highly toxic metal that is linked to a variety of serious illnesses, including cancer; seafood and organ meat have higher levels of cadmium than cigarette smoke. Smoking, as well as high temperature cooking of meat, exposes the body to carcinogenic heterocyclic amines. Eating a diet rich in animal proteins may make you four times more likely to die of cancer than someone with a low-protein diet, which is a mortality risk factor comparable to smoking. Dietary interventions, including increased fruit and vegetable intake and decreased meat intake, may counteract some of smoking’s harmful effects on the human body. A plant-based diet may help prevent chronic obstructive pulmonary disease (COPD) or slow its progression and improve lung function. Curcumin (found in turmeric) may decrease DNA mutations caused by smoking, but not to the level of non-smokers. (Broccoli had a similar effect.) The significant health benefits of green tea may help mitigate the risks of smoking. And smokers get cholesterol-lowering benefits from antioxidant-rich foods, although not as much as non-smokers. The carcinogenic risk of a chest CT scan is like the risk of smoking 700 cigarettes. Smoke inhalation is bad no matter what the source: in terms of lung cancer risk, smoking a single joint of marijuana may be like smoking an entire pack of cigarettes. It took more than 7,000 scientific studies and the death of countless smokers before the first Surgeon General’s report against smoking was released in the 1960’s. Some say that moving to a plant-based diet is the nutritional equivalent of quitting smoking. There are similarities between the strategies used by the tobacco industry in the mid-20th century and those used by food industries in the 21st century—carefully worded denials, attempts to bury damaging reports, funding supportive research, and heavy investment in lobbyists and political influence. There are some serious public health concerns about the legalization of marijuana, but they are probably not what you might expect.